Age: It went live on July 20th 1997, making it over 20 years, 8 months old. 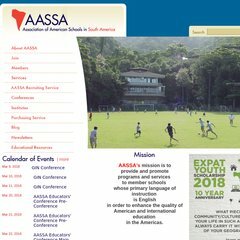 aassa.com Association of American Schools in South America: 2012 AASSA ..
aassa.com Association of American Schools in South America: AASSA Recruiting ..
54 users visit the site each day, each viewing 2.00 pages. Cox Communications Inc (Georgia, Atlanta) is the location of the Microsoft-IIS/6 server. ASP.NET is its coding language environment. ns91.worldnic.com, and ns92.worldnic.com are its DNS Nameservers. PING aassa.ccsct.com (98.175.78.211) 56(84) bytes of data. A ping speed test response, is timed at 39.3 ms.